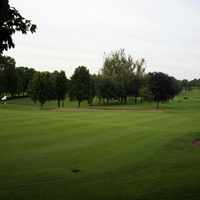 The 18th hole is a par 4 measuring 409 metres is a strong finishing hole as you are likely to find. There is a gap to be negotiated at 220 metres. Once through, you are only halfway there. The green is well protected by 3 large bunkers, two on the left and 1 on the right. The green is set on two tiers and is very difficult to read if you finish on the other side. Par this Index 2 hole and you will have a genuine reason to celebrate in the Clubhouse.